They say a picture is worth a thousand words. Well, we were looking at two pictures. The 2,000-word part was easy. My struggle came with figuring out how many inches were in the photos. 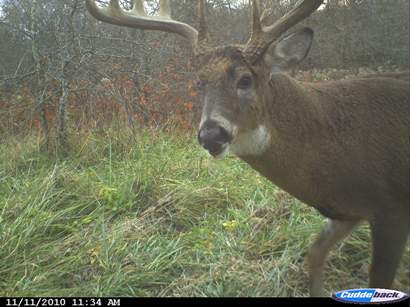 Tyler Sellens had just returned Friday from checking his trail cams. 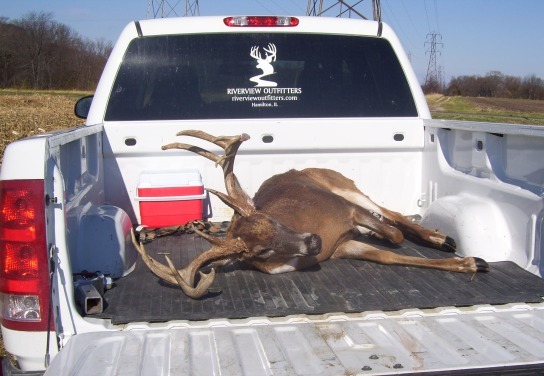 And he wanted to know what I thought this one particular buck would score. I looked quickly – too quickly – and threw a number out that Tyler and my hunting buddy, The Biscuit, clearly weren’t impressed with. The odd looks told me I’d have no problem proving I was running on two hours sleep the last two days. At closer glance, my high 140s mark had absolutely no merit. 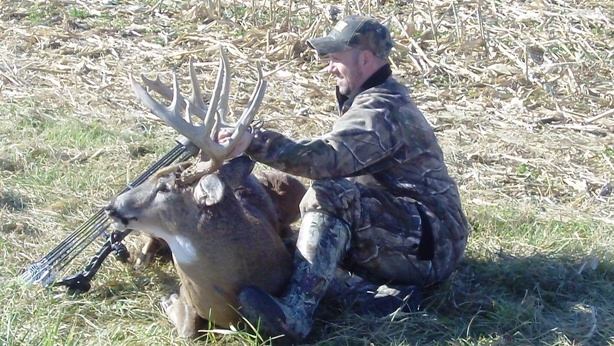 This stud had huge main beams, he had long tines and his mass was of the deer that hunters dream about. I quickly retracted. 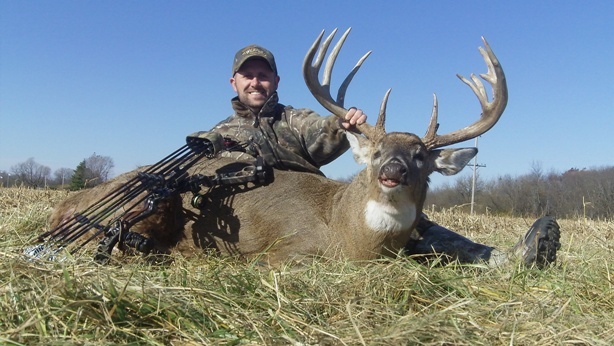 Tyler, who along with Josh Turner makes up Riverview Outfitters in Hancock County, Ill., had two pictures of this buck. The first picture was Thursday morning, the second from Friday morning – but both during daylight. But he also had a challenge. Tyler explained that he and Josh had only one tree to hang a stand in this spot, and his gut told him this deer was working a high trail during his daily ritual of checking for does. 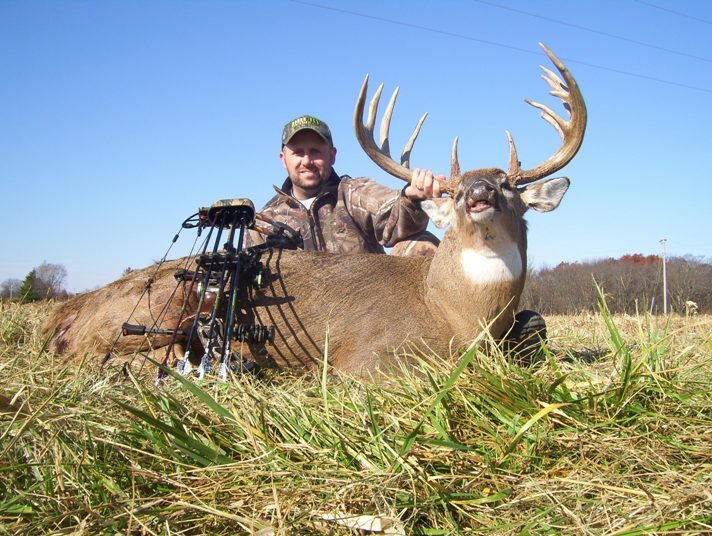 If that remained true, he knew the shot on this deer might be a long one with archery equipment. The Biscuit, and I were only an hour removed from target shooting our bows, doing so at nearly every yardage marker possible – including 50 yards. We both shot well and that had our confidence levels soaring. We both implied that we might be up for the challenge. The stand that they put in this area was, unfortunately for the Biscuit, locked onto a small hickory tree. The Biscuit isn’t … well … small. I am. With the wind correct, I was able to navigate to and climb that stand our first morning of hunting Illinois. I saw and videoed four small bucks over the first couple hours out of that tree. And as the winds were gusting at speeds well into the 40s, I figured the big bucks were probably off their feet and staying as much out of the wind as possible. I had just talked myself into not expecting much movement until the magical time before sunset. The wind remained favorable for this stand, blowing out of the southwest. And that’s when it happened. Nine hours after I arrived at my stand, the biggest deer I’ve ever seen on hoof came walking out of a brushy pile of woods and started on a walk in my direction. As Tyler had predicted, he was on the high trail. I knew right away that everything would have to go perfect in order to get a chance at this deer. I remained very calm – and looking back I’m not sure how. 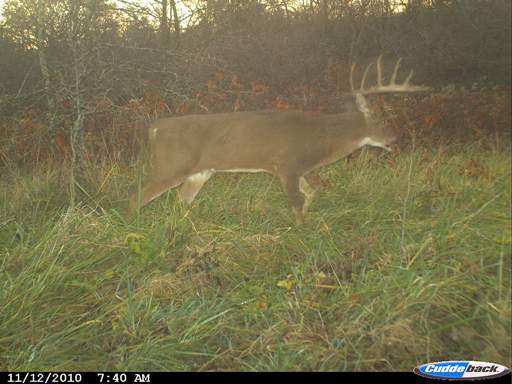 As every hunter who has a large whitetail walking his direction would do, I grabbed my video camera! I’m not sure why that came first, but thankfully I also grabbed my bow and fumbled both in my hands as I sized the situation. The buck walked through a little depression and stopped behind a series of saplings at 60 yards. He started rubbing his antlers on a small tree. I kept the video rolling and somehow managed to reach for my range finder. I’d already ranged this area several times in the morning but decided confirming the distance right now would be best. If he came out of those trees and remained broadside, he would be at 50 yards. If he came down the hill just a little bit, he would be in an opening at 44 yards. I dialed my sight to 45 yards and waited. Somewhere in there I remember making up my mind that I was only going to shoot if everything went perfectly. I recall distinctly thinking that I was going to make this particular deer my week’s mission if the shot didn’t present itself. This was the first day of the hunt and I would have several days to play chess with him. After a couple minutes of rubbing, the deer started moving again. That’s when I threw the video camera into my backpack. For some reason, I never even bothered to turn the record button off. Thus, the remaining pieces of the hunt were played out via sound on my video camera. The buck broke out of the saplings and was walking slow. He walked a couple yards and turned toward my stand a bit. He was going to be on the 44-yard side of the opening. I drew. At full draw I remember thinking that I would only take this shot if everything were still perfect. 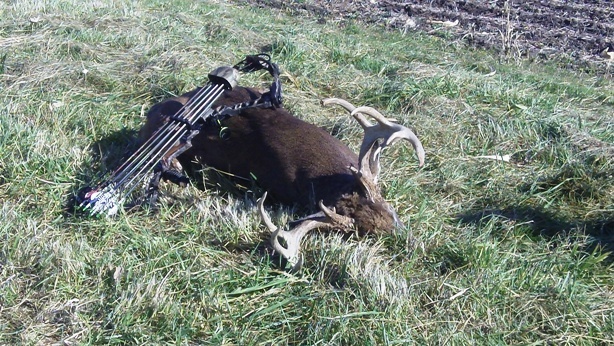 He was broadside at 44 yards. My HHA dial sight was dialed appropriately. I was looking through my peep sight and everything was perfectly aligned with his vitals. I squeezed the release and remained focused intently on where I wanted the arrow to hit. I did not see my arrow in flight, but saw and heard it hit the buck right where I was looking. The buck turned up the hill and I could see the lion’s share of my arrow (all but the fletchings) sticking out of the opposite side of the deer … right where it would indicate a lung shot. I also saw blood – a lot of it – coming out of his side. I was confident in the shot (as was later displayed when I replayed the video sound). I watched the buck run up the hill and out of sight. The shaking started. I grabbed my video camera and realized that it was still on record. After taking a few moments to record my thoughts, which were all rooted in the sheer enjoyment of just shooting the biggest deer of my life, I called Tyler. I climbed out of my stand and went to another hill and waited nearly two full hours for Tyler to meet me to begin tracking. 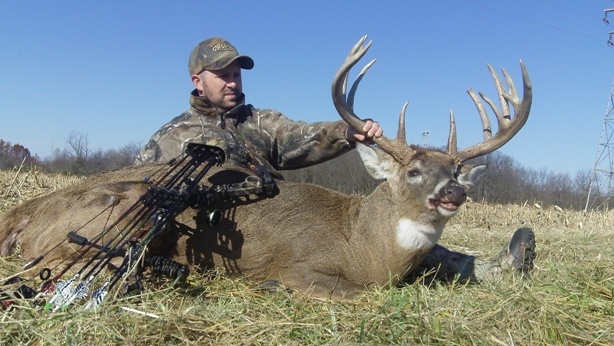 As anyone who has ever shot a whitetail with a bow can attest, those hours are some of the most gut wrenching you can experience. You go through everything in your mind 1,000 times and try to recall any clues that will help in the recovery. I started to question what I had seen. Was I sure the shot was where I thought? Was that blood I saw? Was he even as big as I think he was? Was it the same deer in the trail cam? For the first time since the shot, I replayed the video. I listened to my entire first reaction and realized that there was no way I was seeing things. Replaying the real-time reaction helped build my confidence back up. Tyler arrived and I played the video sound for him too. We started back into the woods to track. We found blood early. The trail was easy to follow. After 70 or so yards, my arrow laid in his tracks. It was covered in blood. As often happens, the trail got wider with blood after that. We walked only another 15 yards and Tyler turned around smiling. I’ve experienced ground shrinkage in the past. This is my first ground growage! 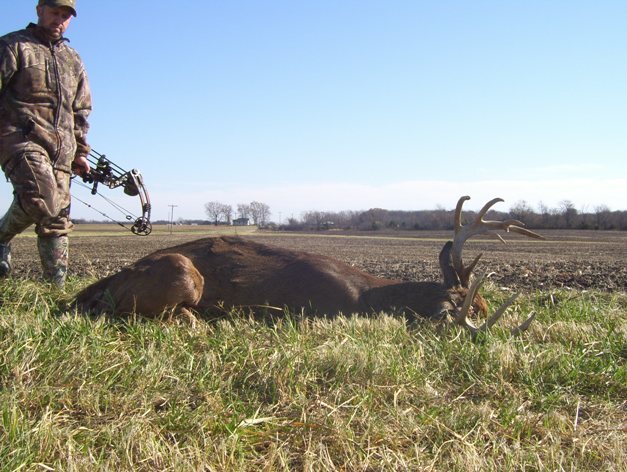 He had points coming out of his main beams, his tines were longer than I remembered and he carried the widest rack I’d ever shot. He was truly a remarkable deer. Tyler and Josh both were as excited as I was to have the bruiser on the ground. They’ve worked their tails off for several months to provide a hunter with an opportunity like this. And it so happened that in this case, I was the hunter. For that, I’m extremely grateful. 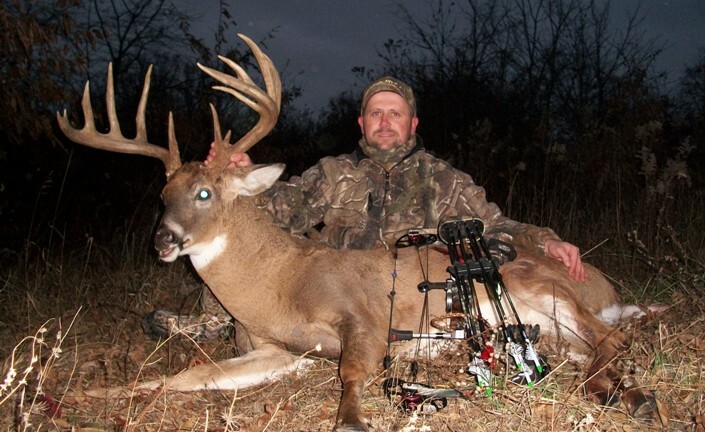 The buck ended up with 15 scoreable points – all intact. And that picture ended up being worth a lot of inches – 185 4/8” in fact! Cat Tales: I’m truly blessed. 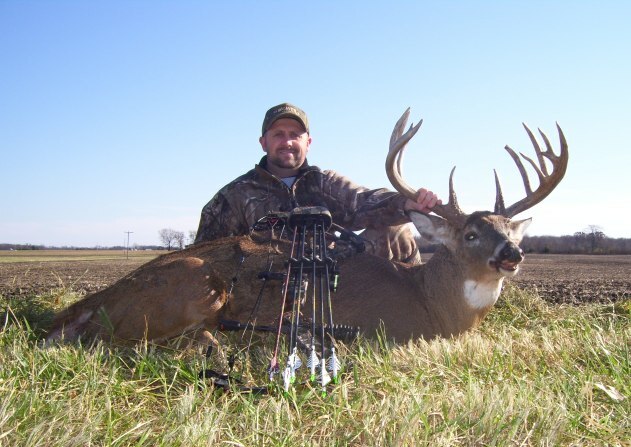 I’ve been able to shoot several nice bucks in my hunting career. Yet, I recognize that this deer is a “once-in-a-lifetime” kind of deer. And for that, I need to thank a few people for helping me fulfill a life dream. Thank you to Nick Pinizzotto, my fellow outdoor blogging friend who had never met me yet thought enough to ask me almost a year ago to join him in Illinois for a hunt with Riverview Outfitters. I also need to thank “my girls.” My wife has dealt with my hunting obsession for over a decade and has been nothing but supportive – even though it often means a couple weeks of running our house solo each fall. My daughter Sara is living her third hunting season and gets almost as excited about deer as I do. And she is the best arrow holder this side of the Mississippi! Finally, thank you dad for introducing me to hunting. I’m as passionate about this sport today as I was as a teenager running around our woods in Western New York. I wish a lot more kids around this world could see what I’ve been fortunate to see. Kurt,I’ve been talking to Tyler at Riverview, he seeems like a nice guy. What about his outfitting? Please try and keep comments unbiased. Ha! I don’t know if I could if I had just killed a booner on his place. Tyler and Josh are both great guys. And, yes, I left a very happy customer, but if that were taken out of the equation, I’d still be going back. My friend who went with me, and who did not shoot a thing, also plans on going back if that tells you anything. Every hunter in camp saw a shooter buck and we had a blast when we weren’t in the woods. They work hard to put you in good spots and the food and lodging is dynamite. I’d be happy to connect with you via e-mail if you want more details. Let me know.